YORK, PA, December 07, 2017 /24-7PressRelease/ — Comprehensive creative digital services company, SociumDigital, partnered with San Diego Christian College to design, build, and launch their award-winning website. The updated site offers a fresh look, easy-to-use navigation, and a wealth of information about the college for prospective, current, and past students. Since it’s accreditation in 1984, San Diego Christian College has been educating and inspiring students. Their new website features improved navigation for current and prospective students. The site leverages multiple media, highlighting current events, academics, athletics, and more. 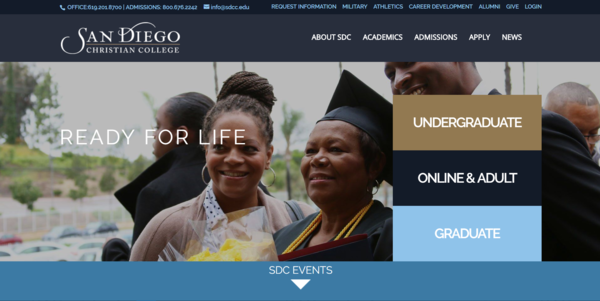 Prospective students can begin the registration process right from the San Diego Christian College website. Additionally, SDC’s website is fully responsive. The design is a 2017 Gold medal winner in the MarCom Awards’ Digital Media | Website, Educational Institution category. About SociumDigital – SociumDigital is a full-service digital marketing company, providing its clients with innovation, customized digital solutions from web design to graphic design to app development to SEO and online marketing services. SociumDigital is available for many creative IT needs for companies of all sizes in all industries. Visit Socium at sociumdigital.com. If you would like more information including a current portfolio, please contact Shawn Boksan at 1-844-820-2905 or email at [email protected].